Blizzard is teasing a Cuban theme for Overwatch’s next big update. Last night, a local newspaper article discussing the changing hands of a Havana-based rum distillery was posted to the game’s official social media channels, prompting speculation over a new map or even an Archive event. The article is ostensibly from local newspaper the Havana Sun, and discusses the Don Rumbotico distillery from the perspective of the founder’s “many-generations-great granddaughter,” Alicia Diaz. According to the article, an anonymous financial organisations – which fans have speculated could represent Talon – attempted to buy out the distillery. When the family refused, shipments started to disappear and the distillery burned down, forcing a sale at a drastically reduced price. The article also discusses a nearby sea fort. Previously property of the Cuban government, it was purchased by the same anonymous company behind Don Rumbotico. Understandably, players are wondering whether these two locations could be part of a new Cuban map in the works at Blizzard, although there could be an even more exciting alternative on the horizon. The teaser has appeared just in time to herald the arrival of a new Archive event. For the past two years, Overwatch Archives events have begun in the second week of April and run until the end of the month. A new event would require a quick turnaround from this teaser, but is definitely possible. 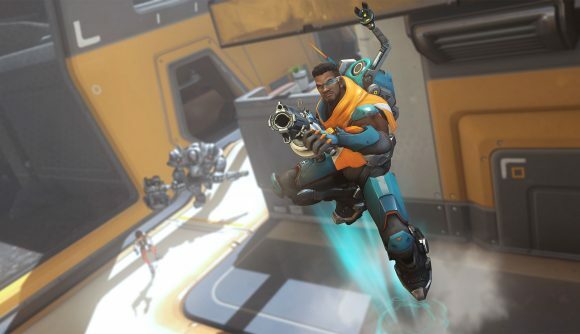 Given Overwatch’s latest hero, Baptiste, is from Cuba’s neighbouring island of Haiti, it seems likely that he might play a part in a new Archive event. Given that the secondary article on that newspaper page references an upcoming hurricane, Baptiste, a combat medic, could come in pretty handy. Much of this is mere speculation, of course, but if this is the start of a new Archives event, we’re likely to find out more in the next few days. If it’s a new map, it’ll probably head to the PTR relatively soon too.